Mail app is the default email client in Windows 10. The Mail app has evolved over the past three years and offers all the features that you would find in a good email client. Windows 10 Mail app uses Calibri as the default font. While there is nothing wrong with the font, there are users who like other fonts and would like to use a different font instead of the default font. For instance, I like the Palatino Linotype font and set it as the default font in Word, Evernote, and other frequently used applications. Up until now, the Mail app allowed us to change the font and font size only while composing an email. This means that the new font and font size was applicable only to the email message that you were composing. The Mail app would not remember the new font and font size once you close the compose window. You had to change the font and font size again when you open the compose window. 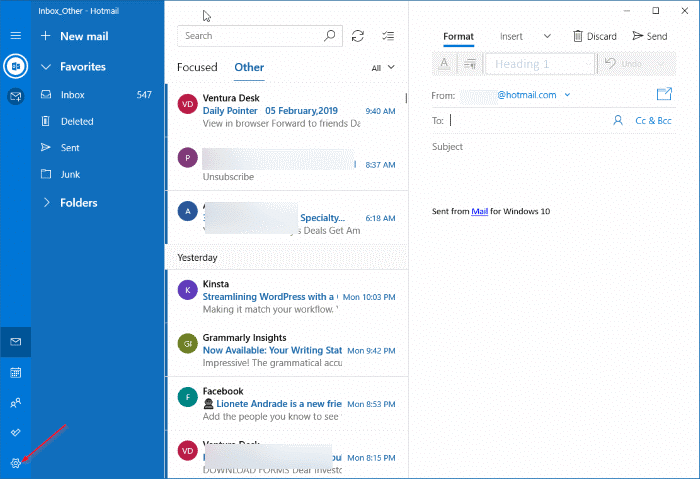 Fortunately, with Windows 10 version 1903, you can set the default font, font size and color of your choice for the Mail app. Unlike in earlier versions, the Mail app will remember the new font and font size. The new font, font size, color and emphasis you have selected will be automatically used when you compose a new email or replay to an existing email. 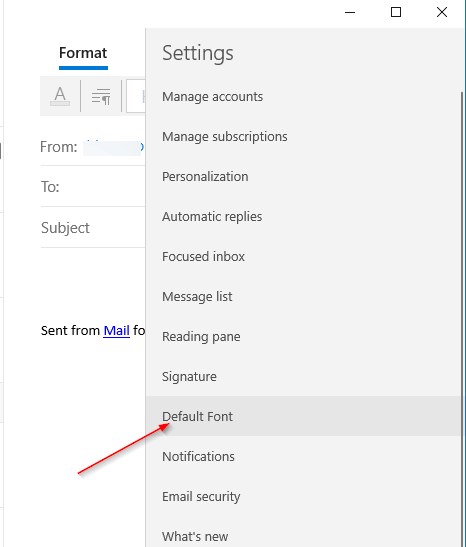 Here is how to change the default font and font size in Windows 10 Mail app. 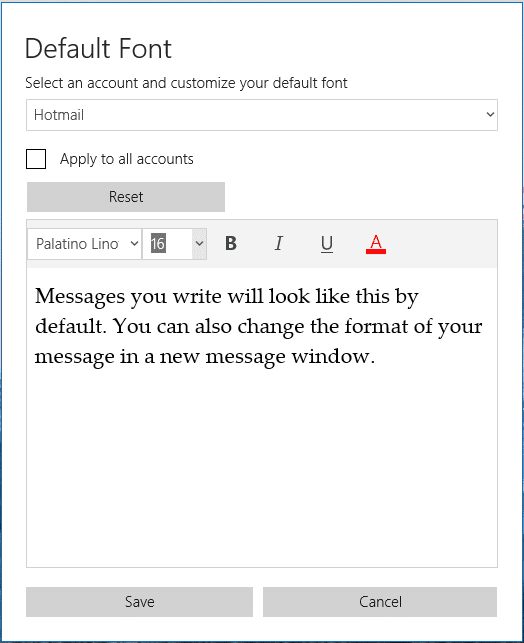 NOTE: You must be running version 1903 or later version of Windows 10 to be able to change the default font in the Mail app. Step 1: Open the Mail app. Click on the gear/settings icon in the left pane to open Settings. Step 2: Look for the Default font link and click on the same to open Default font dialog. Step 3: If you have added two or more accounts to the Mail app, then please select an account from the drop-down box and then select the font, font size, and color you wish to set as the default for the Mail app in Windows 10. If you would like to apply the new font and font size for all accounts (applicable only when there are two or more accounts), and then check the Apply to all accounts box. Finally, click on the Save button to save the new font and font size. At any point in time, to restore the default font and font size, click on the Reset button. Our how to reinstall the Mail app in Windows 10 guide might also be of interest to you.